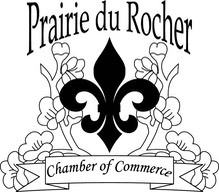 OUR MISSION STATEMENT is to enhance the community by addressing economic development issues and business growth, as well as promoting the well being of Prairie du Rocher as a whole. OUR FOCUS is to accommodate business, industry, workforce development, and tourism in an effort to enhance economic growth in the Village of Prairie du Rocher and Randolph County. When visitor contacts are received, for business or personal referrals, Chamber businesses and services are always recommended first. Our membership drive is ongoing and we encourage businesses, as well as individuals and not-for-profit groups from the Village and surrounding areas to join. We provide various activites and fundraisers throughout the year to promote community spirit and provide funds for our many projects and causes. ANNUAL MEMBERSHIP DUES are collected in April/May for the upcoming fiscal year. Membership includes all the benefits that the Chamber can provide as well as a listing on our website providing links as you request to your business sites. Dues remain unchanged from the original fees that were put in place when the Chamber was formed in 2008. A membership can only result in an investment in your community! © 2008 Prairie du Rocher Chamber of Commerce. All Rights Reserved.